Home » Blog » Have you Wondered about those 3D Movies and your Eyes? Have you Wondered about those 3D Movies and your Eyes? 3D movies. They appeal to the child in all of us – or at least most of us. You may have begged to be taken to such films as a child yourself and may have reveled in the wonder created by those red and blue plastic lenses. 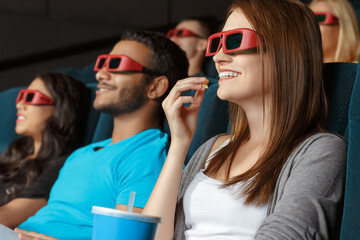 Today, 3D movies may not involve the same spectacles (polarized lenses are the modern version), but they do elicit a lot of the same amazement among crowns. The draw of 3D may not be shared by everyone. You may be one of those people who wonder what you’re missing. If you have attempted to take in the technologically advanced images intended to jump off the big screen and noticed that your eyes seem to resist, you’re not alone. There is a fair percentage of folks who simply cannot sit through such a film without a good case of queasiness. We don’t usually give much thought to how our eyes work and why we see the way that we do. The objects that we view on a daily basis have shape, depth, 3 dimensions rather than a flat 2-dimensional tone. Our eyes work together to create this view, each providing a unique perspective that overlaps the other. You can observe this easily, just observe the room you are in right now with one eye closed, and then with the other. It is this same function that is recreated in the 3D flick. The way that natural visual perception is recreated is relatively easy. All it takes is the proper placement of two camera lenses. When lenses film from a few inches apart, just like the eyes, two slightly different angles are obtained. These angles then overlap to build depth. The interesting thing is that, because the eyes do this naturally, they cannot observe this recreation of the norm. That is why special glasses must be worn during a 3D film. 3D doesn’t work for everyone. You may be one who gets that motion-sick feeling during a 3D film. The reason this occurs in some people is that of a slight inconsistency in binocular vision, the way in which the eyes interact. Luckily, there is no harm in having small variances in binocular vision. It may mean, though, that you bow out of the next 3D movie showing!